A twitter Employee deleted Trumps account on the last day of work. 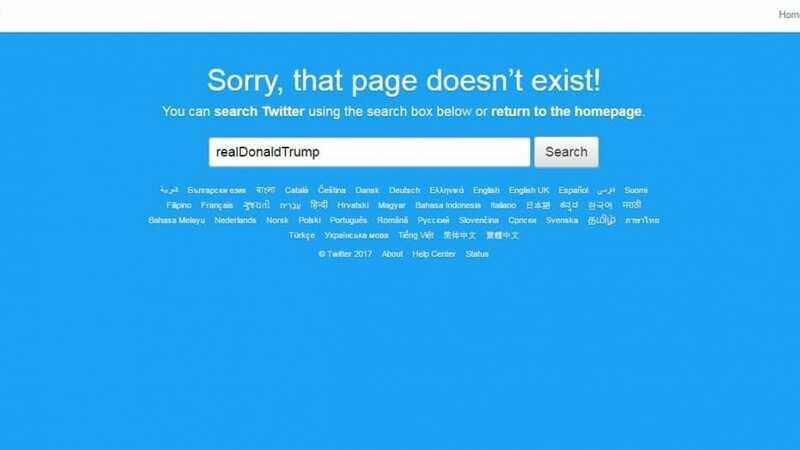 The Twittersphere lit up Thursday night when President Donald Trump’s official Twitter account @realDonaldTrump had briefly gone offline. Anyone who navigated to his feed was given a generic blue landing page that read, “Sorry, that page doesn’t exist!”. Perhaps one of the most defining elements of his presidency, so far is how The President uses Twitter consistently makes headlines and make statements against anyone and everyone. He has even used it for diplomatic purposes, especially, against the North Korean leader. Twitter are reportedly carrying out an investigation. It didn’t last long though as Trump’s account was restored within minutes. But that did not stop Twitter blowing up with speculation and plenty of sarcastic jokes about Trump’s brief exodus. We’ll all remember where we were during the 10 minutes of peace while Donald Trump’s Twitter account was down. Many people have called for Trump to be barred from using the platform, arguing his tweets could plunge America and the world into a nuclear war. But Twitter declined to bar Trump’s account, saying it must weigh the newsworthiness of Trump’s tweets with its violent rhetoric. It is a real phenomenon how the President uses his twitter account to communicate and he has done so consistently during his election campaign and now his presidency. He is never shy of expressing his feelings and emotions and allows him to reach out to millions of people within minutes. It will become a defining moment for all future presidents and Twitter as his social media PR has been imitated by other world leaders now as well.